This week's Tuesdays with Dorie (TWD) recipe was actually the Mocha-Walnut Marbled Bundt Cake, but in the spirit of Easter, our leader Laurie let us swap weeks and we were allowed to make the Coconut Tea Cake from last week, chosen by Carmen of Carmen Cooks. Time was short, and this recipe was a breeze to whip up. 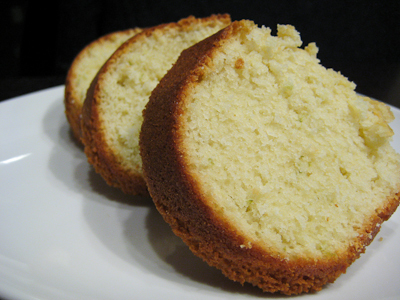 I made the coconut lime version, with the use of lime sugar and rum in the batter. The lime flavor was subtle, though I could definitely see pretty little flecks of lime zest in the finished product. As for the coconut, I could recognize the bits of shredded coconut in each bite, but I was hoping that the addition of coconut milk would lend a stronger coconut flavor. Thanks, Carmen, for hosting this (last) week. If you would like the recipe, you can find it here. Make sure you check out the TWD Blogroll, to see how everyone else enjoyed this coconut-y treat! - Take the cake out just as it begins to turn a nice golden color. Leave it in too long and it will dry out. Mine was done right around 60 minutes. Your little bunny with her bunny is adorable! And lovely cake! Looks like a delicious, moist cake! Oh my goodness, what a cutie!! Your cake looks delicious - we enjoyed it last week. I bet the lime was great in it! What a doll! She is adorable! The cake looks great, too! Your daughter is beautiful! The cake sound wonderful. I can't wait to make it. Such a little sweetheart!! Love those pillows too. Your little girl is such a cutie-pie! I went the coconut lime route as well. 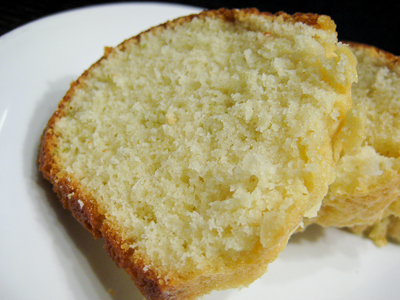 I enjoyed the cake plain, but also did a lime glazed version, which really punched up the flavor quotient. I love how moist your cake looks in your photos! Your babygirl is a cutie! She's getting soo big, God bless her! Sound like you guys had a happy and delicious Easter! Wow, she is so cute! I love seeing her pictures. I made the coconut cake this week too. I agree that it was weak on the coconut flavor, but other than that it was a good cake. Cake schmake. Your daughter is so cute! Love her dress. 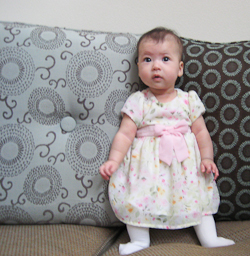 Can't believe she's old enough to stand on the couch like that! Key-ute! Aw your daughter is so sweet!! And yummm at that cake it looks so good!! 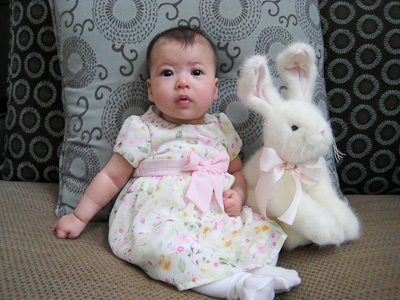 she is so cute in her easter dress! the cake looks good--we enjoyed this one.